Earn up to 36,712 reward points. Features a 3-1/3 octave range (C-E) and sets the standard in sound and function. 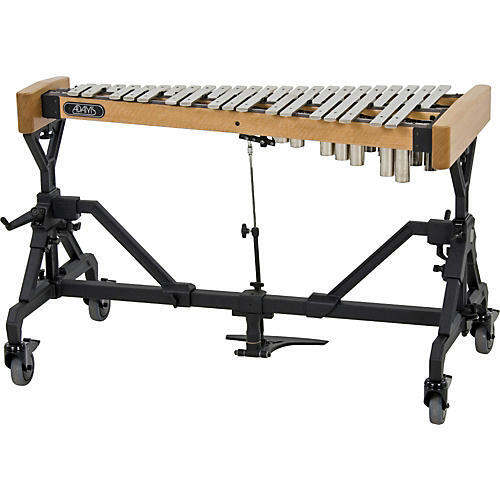 The new Artist Series GAT33 Orchestra Bells from Adams Concert Percussion bring together the most sought-after 'vintage' bell sound with a strong and steady Traveler Frame and reversible foot-operated damper system. These orchestra bells exhibit the right timbre, resonance, and tone to match the characteristics of that 1920s American sound, which musicians around the world feel set the standard for quality and tonality. The Adams Traveler Frame is a new addition for the concert glockenspiel, borrowed from its success with the very popular AV-1 vibraphone. The Traveler Frame offers the durability and stability of an Adams Endurance Field Frame, but has the elegance to be at home in a club or on a concert stage. Adams GAT33 Orchestra Bells also feature an open rail system, which not only allows for a foot-operated damper system, but also eliminates "case noise" that is normally produced by bells that are mounted in a box. The patent-pending reversible damper system allows the player to operate the pedal like a vibraphone (normal on/pedal down to release) or in a reverse position (pedal off/pedal down to dampen) depending on the musical necessity. Open rail system allows for a foot-operated damper system, eliminates "case noise"